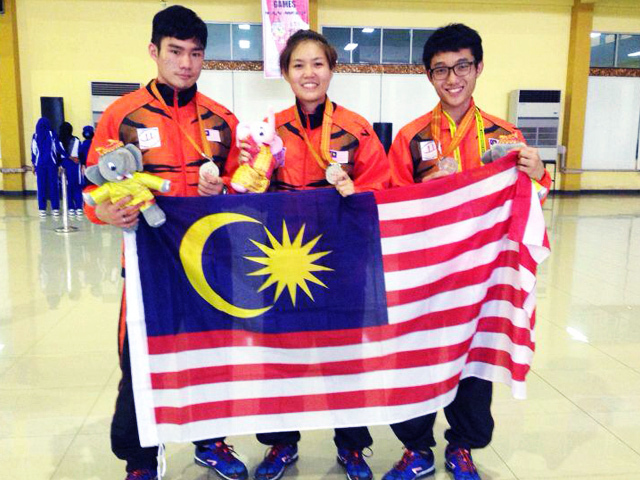 UTAR’s Faculty of Business and Finance Year One student, Ooi Hong Chuan won a bronze medal in the Men Sanda below 56 Kg event at the recent 17th ASEAN University Games 2014. Held at the Sri Vijaya Promotion Centre, Palembang in Indonesia from 7 to 14 December 2014, the ASEAN University Games is a multi-discipline sports event in which student athletes from all over ASEAN universities compete for medals. “This was the first time I competed in this competition and it was a great opportunity for me to represent Malaysia. Participating in the competition was very educational especially on the culture of sports competition and it was a very humbling experience,” said Ooi, who is also a member of UTAR Wushu Club. The ASEAN University Games is a biennial sports event that involves athletes from the universities of the ASEAN member countries. Organised by the members of the ASEAN University Sports Council, a total of eleven countries took part in this competition.